When it comes to growth and popularity, few apps can match Instagram’s trajectory. Over the past several years the platform has seen its user base grow to over 600 million active users and more than 95 million photos/videos shared per day. In tandem, Instagram more than doubled its advertiser base within the first six months of 2016. Brands have taken notice of this trend and many have placed a greater emphasis on creating Instagram content as part of their social strategy. Today we’re excited to announce Instagram Scheduling in Sprout Social, an update that simplifies content planning and creation for Instagram. Brands can save time and optimize their planning with creative tools, intuitive workflows and powerful scheduling features all within a single platform. Much of Instagram’s user content is spontaneous and posted in the moment, but that isn’t always the case for brands. Scheduling prepared content is helpful when planning posts for numerous social networks and timing them to optimize their engagement rate. Seeing and planning your overall social strategy can be especially difficult when planning Instagram content exclusively from a mobile device. 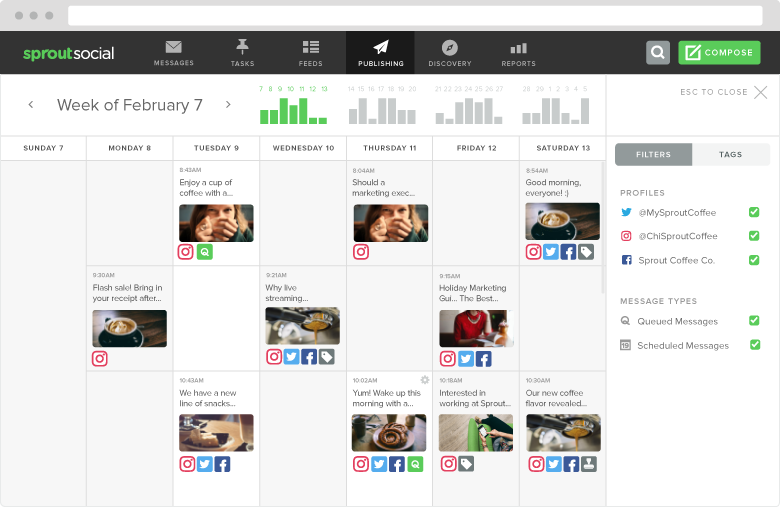 Sprout’s shared content calendar makes that preparation efficient by giving a bird’s-eye view of your content campaigns, where you’ll see Instagram posts alongside your various profiles and networks. In addition to manually scheduling content at specific times, posts can be automatically timed with queued messages and ViralPost® or submitted for approval (Professional and Advanced plans only). Laying the groundwork for publishing a post can require creative and thoughtful preparation. To assist your workflow, Instagram Scheduling ties in the powerful tools from Sprout’s publishing suite. Instagram posts are created from Compose where you’ll have access to features such as the Image Editor and Image Asset Library (Advanced plan only). Once your content feels polished and ready, select an Instagram account from the profile picker and a dedicated publisher. Choosing a dedicated publisher gives you the flexibility to distribute publishing duties across different members on your team. From here you can draft, schedule, queue or submit the post for approval. 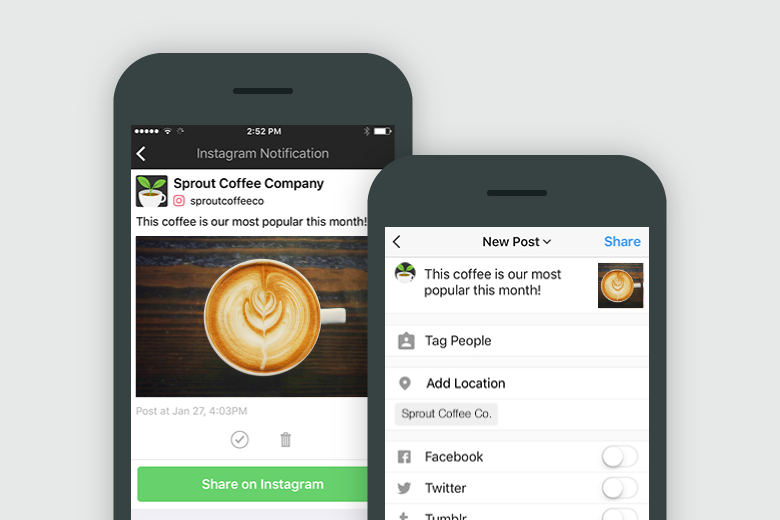 When it’s time to post, the chosen publisher will receive a push notification from Sprout’s mobile app. Open the notification to review the image, and the caption will be automatically copied to your clipboard. Simply tap the “Share on Instagram” button to pass the contents of your post to the native Instagram app where you can paste the caption, make any final edits and publish the post. In addition to the publishing calendar, you can stay informed on the status of your upcoming Instagram posts in a new Publishing Notifications feed. Visit this feed on web or mobile to resend a push notification or to ensure a notification has been opened in the Instagram app. 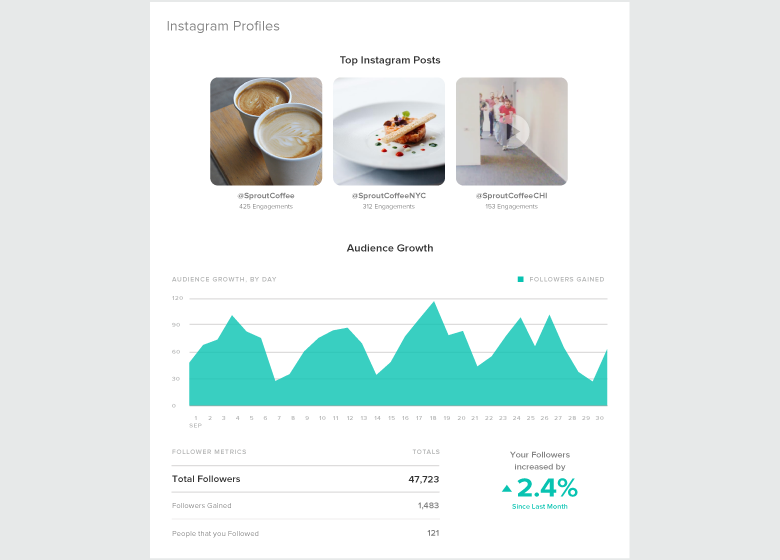 You can also access powerful profile and post-level insights through Sprout’s Instagram Analytics to refine and improve your Instagram content strategy. Quickly identify top performing posts with the Instagram Profiles Report and Sent Messages Report to track comments, likes and engagements. Additionally, you can measure follower growth, hashtags, trends and more across customizable time periods. Instagram Scheduling in Sprout Social is the latest update designed to help you manage the preparation and delivery of engaging content to your audiences. To learn more about Sprout’s Instagram workflow and how it can benefit your organization, contact your Sprout representative or email sales@sproutsocial.com. Stay tuned for more updates to Sprout’s publishing tools and feel free to share your feedback.